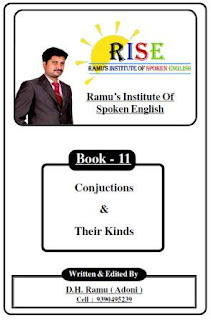 This book is prepared and published by Mr. Ramu from Adoni , Kurnool (Dist), A.P.His Books and Videos are prepared purely for the Telugu Medium based students.His main intention is to make the illiterates at least to write and read.Finally his main ambition is to improve at least somebody who are suffering from English. A conjunction is the glue that holds words, phrases and clauses (both dependent and independent) together.There are three different kinds of conjunctions––coordinating, subordinating, and correlative––each serving its own, distinct purpose, but all working to bring words together.In other word The conjunction is the part of speech used as a “joiner” for words, phrases, or clauses in a particular sentence. It links these words or groups of words together, in such a way that certain relationships among these different parts of the sentence will be established, and the thoughts that all of these convey will be connected. ➥What are the Different Types of Conjunctions? 1. Coordinating Conjunction:Among the three types of conjunctions, this is probably the most common one. The main function of coordinating conjunctions is to join words, phrases, and clauses together, which are usually grammatically equal. Aside from that, this type of conjunctions is placed in between the words or groups of words that it links together, and not at the beginning or at the end. 2. Subordinating Conjunction:This type of conjunctions is used in linking two clauses together. Aside from the fact that they introduce a dependent clause, subordinating conjunctions also describe the relationship between the dependent clause and the independent clause in the sentence. 3. Correlative Conjunction:The correlative conjunctions are simply pairs of conjunctions which are used to join equal sentence elements together.